The giveaway is closed and the winner has been notified. This quilt is almost done. blocks and sew the blocks together. Need a Christmas quilt as a gift. This could be just the ticket for you. I love 3 Sisters fabric – you can never have enough! I'm a 3 Sisters junky! I want to know who they really are and who is behind the magic of all their lines! I've never seen them in person or on a blog hop or anything. Share the secret behind the designers of this line! AND – Chocolat was one of my most favorite lines ever! Bought it the first time and stocked up again with Double! Beautiful quilt. Would love to finish this one and have a head start on a charity quilt I need to sew. thank you so much for the Kansas Troubles win – that is fantastic! This is so awesome. I would love to win and pass it my newly quilting daughter. Can't believe you are parting with it! 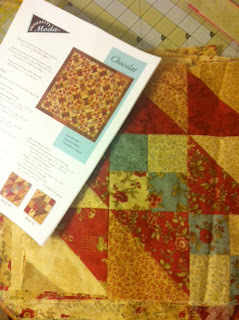 I would love to finish your Chocolat quilt! Chocolat was such a great line and always I had purchased some of the line. Thanks for the chance to maybe get the Chocolat quilt! How great would that be?!? I am amazed at the goodies you have in your stash! It's like rummaging in someone else's closet. So fun. Thanks. Wow! I'd love to finish this quilt… my colors, for sure. Wow, I'd really like to finish the quilt and if I could part with it, would be a nice gift! I have always loved the chocolate fabric, so would be thrilled to win this. Keep cleaning out! I'd love to win this – it's one of my most favorite lines of fabric. I think I had a charm pack once upon a time. Thank you so much for the chance. I love fall colors are ths is my favorite block. I love this fabric. I made two charm square quilts from it. One was a pinwheel quilt! This would be fun to finish! Very pretty! Maybe I could finish it pretty quickly since it already has much of the work done!! Would love to finish this. I need a new quilt for my couch. I would love to win this! Thanks for a chance! Would love a chance to win this wonderful collection of Chocolat. I did not have the chance to buy any, and would enjoy finishing and loving the quilt. Thanks for the chance! I would LOVE to give your blocks a new home! This would be the best giveaway to win. It's almost done!!! It would be fun to finish this and give it away to one of the many orgs gathering quilts for those in need. This lovely. I would be happy to have it. Oh I would love to finish this and curl up in it! I can't believe you are giving it way! Thanks so much for the chance! Are you really giving this away??? Seriously? I would be happy to take it off of your hands & I love chocolat. Please count me in. Did you say chocolate? I love all kinds of Chocolate, especially the non fattening fabric kind!! Your giveaways just keep getting better! I would love to win this, I know my Mother-in-law would love it. Thanks for the chanc e to win. Wow. Nice one. I'll give it a try. I love the colors in this quilt. It would have a good home with me. I'd love to have almost finished Christmas quilt. Nice to get a good start on a Christmas gift for one in my life. Thanks. Oh My! The 3 Sisters are absolutely one my favorite designers! And Chocolat is one of my very favorite groups! Would love a chance to win. Thanks for the opportunity! Chocolate is good in any form, and this fabric line is soooo satisfying! I would be happy to finish this quilt. I can be pretty good at finishing up…..its the take charge and dive in on a new project that I seem to have problems with! I am not a very good finisher. I have four quilts with blocks made just need to be put together and quilted. Starting to work towards being a finisher now.